So I have been playing around on my InstaStory recently and I’ve really enjoyed it. I’m trying to produce one Belleau Kitchen Bake-Off once a week on a Sunday where I do a step by step film of the dish of the day. I’ve had lots of lovely feedback and I will continue to do them as and when I can. The InstaStory only stays live for 24 hours so it’s a ‘catch it if you can’ type scenario. I kinda love this idea but it would also be nice to capture the little films and eventually I will and start producing proper films. I may even start my own youtube accounts – I know right, just call me a millennial already… anyway, last Sunday I made this roast chicken thigh dish. It’s a classic Belleau Kitchen meal, one that you’ve seen hundreds of times but never on film. 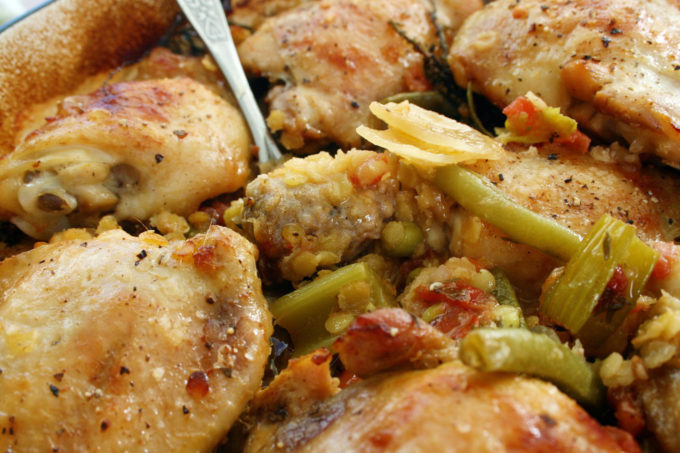 The dish itself is gloriously simple to make yet delivers bigly in the taste department… just go ahead and make it already… You can make it today and eat it for lunch tomorrow or freeze it for Sunday or meals during the week… and remember my rule about chicken thighs, skin on and bone in is the best, juiciest and tastiest so don’t try and be healthy here, all those bits add to the flavour and you can always remove the skin when it’s on your plate… if you have to. 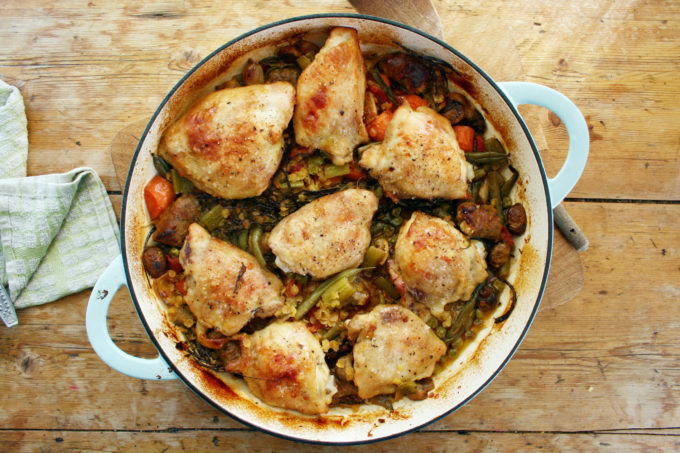 I also love that Ottolenghi recently featured a selection of slow-cooked chicken thigh recipes in The Guardian, hailing the chicken thigh as the tastiest part of the chicken, something that I feel I have been championing for quite some time now! 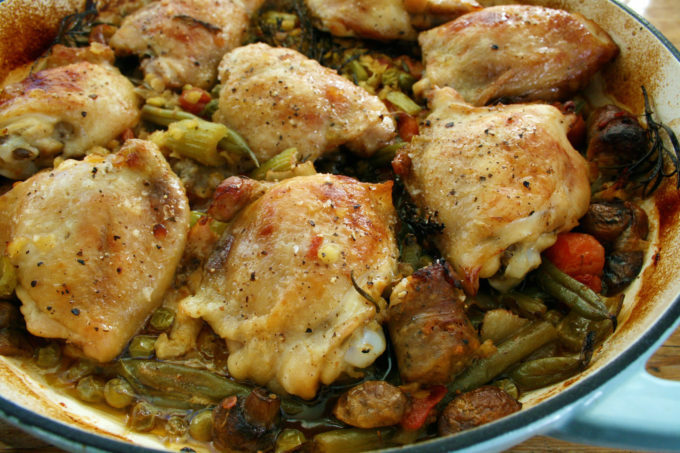 8 free-range chicken thighs – skin on and bone in. place all the veg into the bottom of your dish, season well with herbs and salt and pepper, drizzle with a little olive oil and then get your hands in and toss it all together, pour over the wine. after 15 mins, turn the thighs back over so they’re skin side up, add a little more stick if it’s looking dry, although it really shouldn’t and roast for a final 30 mins with the lid off until the thighs are gloriously golden and crispy. I’m definitely a thigh girl! Was only thinking about the need to have a chicken pot roast soon….. This has convinced me the weekend may be sorted!